Right now, I’m at the tail end of a $5M sales cycle with a $10B global manufacturer, working directly with the CIO and his team in a sole source evaluation. This one deal represents 250% of my annual quota at OSI Consulting. What’s better, OSI’s value proposition is a perfect fit, and our team is capable of delivering the solution. It’s a win-win-win scenario for my prospect, my company, and me. I’m not bragging, but I’m sharing the details to prove a point: social selling works, and it can work for you too. The following is an overview of the process I used to identify the opportunity, set the initial phone appointment and get a warm introduction to the key decision-makers. In this particular case, I had no 2nd or 3rd degree connections to my initial point of contact; rather, I used InMail with a multi-channel follow-up strategy to set up the first call. Earlier in the year, I used LinkedIn’s tagging feature to keep tabs on a highly regarded business executive (with an EVP title) in the manufacturing industry. At one point, I noticed that he had made a move to another company. This was the impetus for me to reach out, as executive career changes often times signal the launch of some strategic initiative or project within an organization. Today, LinkedIn’s Sales Navigator makes the process of identifying opportunities and entry points easier than ever before. With the ability to save Leads and Accounts, I now have a customized dashboard that provides real-time visibility into activity and intelligence such as job changes, content sharing, company news and potential leads. The significance is that I can use these insights to open dialogues with the people and companies that matter most to me through timely, relevant messages. It’s a salesperson’s dream come true. In any sales cycle, the last step to close is always the same: customer references. Taking the reverse approach – using references and success stories as a hook to set an initial appointment – is equally important and can be highly effective when done right. Naturally, the best references to convey with this approach are companies that are most like your prospect (same industry, size, and challenges). In the account above, I used InMail as my first line of communication to the EVP. 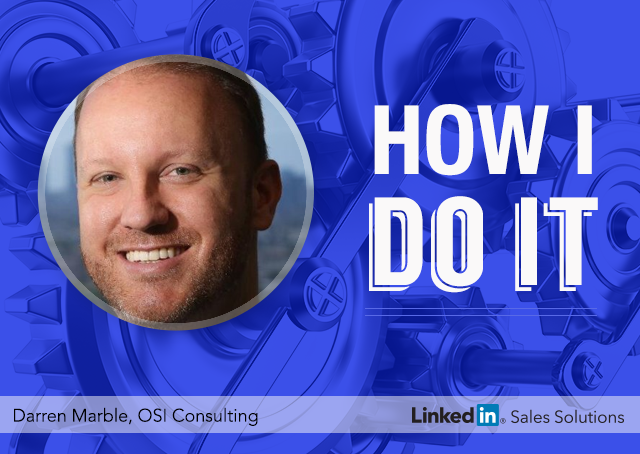 I opened by asking for a 15 minute call and proceeded to share a compelling anecdote (in 2 sentences) about how OSI solved a critical business challenge for a similar company. I closed by asking my prospect to reply with his availability for a brief call, thanking him in advance for his consideration. Knowing that the secret to InMail success is the “process”, I spent the next two weeks cycling my same message via email, voicemail, Twitter, and InMail again – politely asking each time for an appointment. After 6 pings, I finally reached my prospect by phone and he agreed to schedule the call. Would you believe me if I told you that after 2 weeks of soliciting the EVP for a call, he wasn’t really the person I wanted to speak with? Well, it’s true. As a rule of thumb, it’s generally ineffective to directly pursue the person you want to sell to when you have no warm introductions to them through your LinkedIn connections. My strategy was to start with the EVP and get referred down. On our initial call, I shared OSI’s credentials and went into detail on our customer reference. The story I told was authentic, well rehearsed, and well received. While the EVP was impressed, he stated that his VP of IT was the better contact to evaluate our services – so he offered a warm introduction. Once the introduction was made, I had the credibility I needed to schedule an in-depth discovery call with the VP IT, who shared the background and context on a strategic IT initiative that he was overseeing. Now, several months later, I am working directly with the CIO (who I was introduced to after just a few meetings), have been given a soft verbal, and I am close to getting the deal. Engage with Actionable Insights: Use Sales Navigator or other social listening tools to leverage real-time activity or intelligence to open meaningful dialogues with target Leads and Accounts. Lead with References: Be an authentic and inspirational storyteller and intrigue your prospects with captivating customer success stories at the outset of a sales cycle. Aim High, Get Referred Down: Target your initial call with a business executive who can make a warm introduction to the right audience – it will carry its weight in gold.